The number one home decor question I get asked is, “Where are those gold picture frames from?” (Fancy place called Target. You’ve probably never heard of it). I wrote a post about it about a year ago when we first got it, but I’ve had so many questions about how it’s held up and if we still like it, that I thought a follow-up post might be in order. (Also, one of the requests from my reader survey was for more posts that talked about how I liked products after using them for a year or so). We’ve had it for about 14 months now, and it’s for sure the most-used piece of furniture in our house. The girls snuggle up with a blanket there in the morning while I make them breakfast, Ani and I do homeschool there many mornings, it acts as a landing pad after school as the girls unload their backpacks, if we’re reading books, it’s almost always on that couch, we gather there as a family for scriptures and prayer after dinner, and then Bart and I are there every evening either working together or watching an episode of Hawaii Five-O. 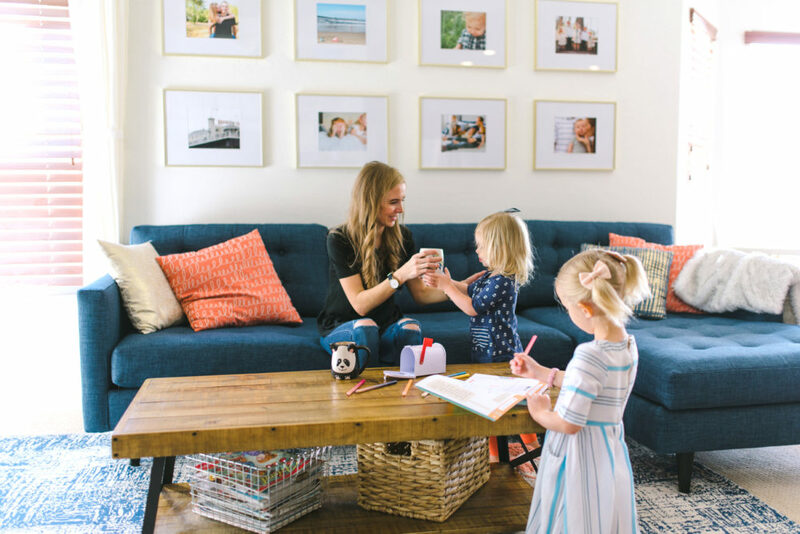 It’s also in a high-traffic spot, since the family room is connected to both the eating area and the back door, so there are lots of little feet and sticky hands in the vicinity. Since it’s the nicest couch we’ve ever had, we’ve tried to be pretty careful with it, but I’ve nursed the baby on it approximately 500 times, there have been many a late-night bowl of ice cream consumed on it, and it has not escaped all baby spit-up. Also, although I try to keep it to a minimum, my children jump on the couch more often than I would like or climb on the back cushions (which makes me cringe so much). All of that, and it basically looks brand-new. Some of this might be thanks to the color we picked (navy), which probably hides dirt and any pilling more than, say, a light gray might. Speaking of which, pilling is the question I get most often about this couch, because apparently that’s a big problem with similar couches. From a distance, I haven’t noticed any pilling at all, but before I wrote this post I got up and close and personal to check it out. I THINK there might be a tiny tiny bit of pilling on the front of the couch cushions where your calves rub against it, but even that is so minimal, I don’t think you’d ever notice unless you were really looking for it closely. The only problem we’ve had is because we picked the tufted version, we’ve had one button come off after a year, but we just sewed it back on (I bought a giant upholstery needle at Jo-Ann Fabrics) and it’s good as new. If you went with a non-tufted version (this is the same couch as we have just minus the tufting), then you wouldn’t have to worry about that. But I love the look of the tufted one, so resewing on a single button once a year seems like a small price to pay. I asked Bart if he had any complaints about the couch and the only thing he mentioned is that because of the dark color, white fuzz or threads show up more on this couch. 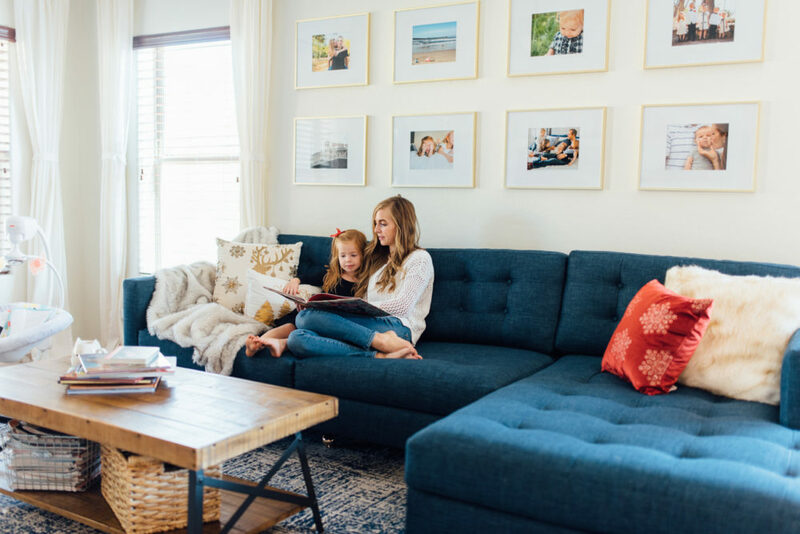 It’s also a very comfortable couch – I took many naps on it when I had a newborn and I love snuggling up on it with the girls to read-aloud or in the evening in jammies. And it manages to look so good while being so practical. It’s made our family room look a million times better than it did before, it’s a perfect size, and the color is so rich and gorgeous. I liked it when we got it, but now that we’ve had it for more than a year, I love it even more because it’s worn so well, is so comfortable, and looks fantastic. 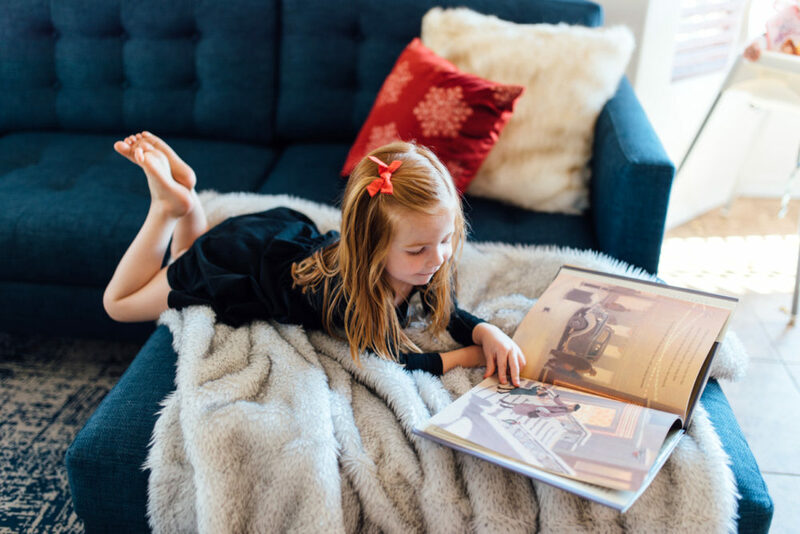 We use the chaise part a lot – it’s the most popular place for the girls to curl up with a book, and I love sitting there when we’re working or watching at night. We bought a different (cheaper) couch for our basement and on a daily basis, I wish we’d gotten a second Apt2B couch. I feel like I’m CONSTANTLY adjusting the cushions on the couch downstairs since they slide out every single time you sit on them. Also, the cushions downstairs are all single-sided, so you can’t flip them over (both the cushions on the back of the couch and the cushions on the seats), whereas our Apt2B couch has all double-sided cushions so if eventually they get really worn, we can flip any of them over and they’re as good as new. (The only exception is the chaise lounge cushion which is cut to accommodate the arm, so if you flipped it over, it wouldn’t fit anymore). Plus, it’s not nearly as comfortable as our Apt2B couch. This year, I want to get two new arm chairs for the family room (the faux-velvet one we bought for $24 at Goodwill in Durham that has no velvet left on the arms might need to finally be retired. . . ) and you better believe I’ve been scoping out the options from Apt2B. If you have other questions about this couch, I’m happy to try to answer! I’m couch shopping now and I love this one. I was leaning towards grey but I love the idea of navy after seeing this one. Can I get where the beautiful rug is from? So excited to hear that you’re still loving your (blue) couch! 🙂 We absolutely adore the photos of you and your family on it 🙂 So glad you guys are having a great time with it. Are the cushions on the back attached? I’ve been looking at this couch, but I’m worried my 3 little boys will constantly have the pillows piled up on the floor. If they are detached, do you find that they stay in place pretty well, or do you have to adjust them a lot? They aren’t attached, but I NEVER had problems with them – in 2 years, I don’t remember ever adjusting them except when I took them off to vacuum under the cushions. The sectional in our basement was a nightmare with the cushions always needing to be readjusted and the girls pulling them off, but this blue one was a dream. Hello! I am looking at a different Apt2B chaise sofa and am trying to decide between “Navy” and “Baltic.” Is this the true Navy or are you just using that word as a general description for the color? Because there are like 5 navy looking colors. If it is actually named Navy, I’m wondering if you’ve noticed any rippling in fabric once you stand up? It doesn’t look like it from the pics but the Navy fabric is so light weight and soft, I’m worried it might ripple moreso than one of the stiffer options. Thanks in advance for any input! Yep! 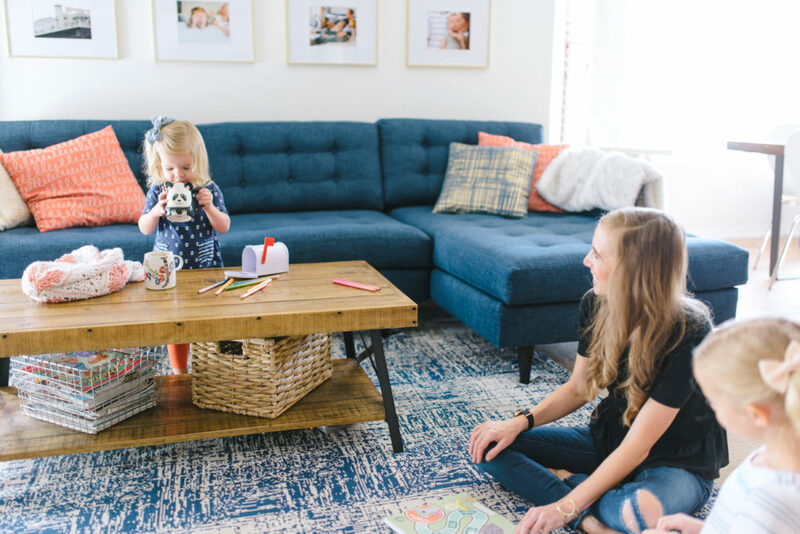 It’s the actual name “Navy.” And we’ve loved – it’s still my favorite piece of furniture!